The Kraken system expands the capabilities of the world-renowned TRACS training robot line with a remotely-operated electric vehicle capable of carrying heavy loads and running at faster speeds than the TRACS mobile infantry target platform. The Kraken is built upon a 48-volt 4.4 horsepower AC induction drive train chassis with independent front suspension, 22-inch off-road tires, 800 lb load-capacity, and a top speed of 20 kph (higher speeds available). The Kraken can be used as a target platform for vehicular targets such as trucks or tanks. It can also be used to tow trailers equipped with targets. 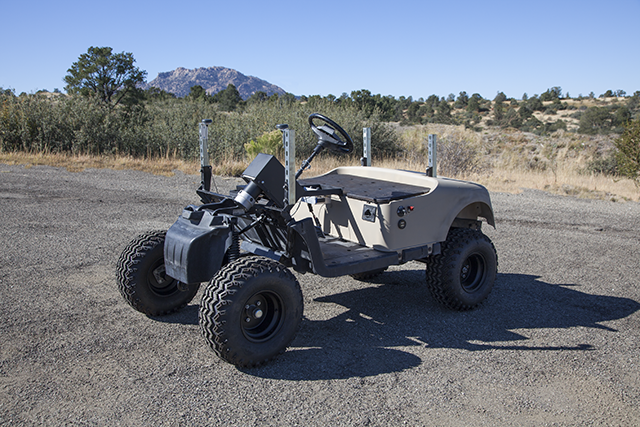 A versatile mounting system means the chassis can be adapted for use as “mule” for transporting gear needed by ground troops or as a remote-controlled field ambulance.